I recently found a great website dedicated to my home town of Wigan. I was actually born two miles outside of the town in an urban village but ‘going to town’ meant going to Wigan. 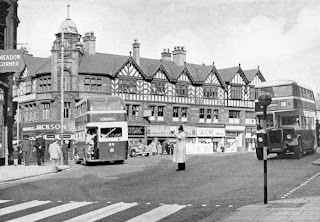 Most of the shops we used in the early sixties were local. The nearest we came to a supermarket was a chain of shops called Morton & Sons who sold everything. Within spitting distance of each other were Dewhurst butchers and Robinson’s Fruit and Veg. All family owned and run. Once a week mum and I would make the trip to Wigan from Ince Bar on the local Wigan Corporation bus. The first fare I remember was 2d (in old money, just over a new penny in value) and half price for kids. The buses were cherry and white, the same as the famous Wigan Rugby League team. The journey seemed to take ages but was probably no more than 15 minutes. Part of it went over the canal bridge and I always hoped the bus would go over this quickly so that my stomach would churn and tickle. In those days you had conductors as well as drivers and you got on and off the bus via the open platform at the back, no closing doors. The bus stop in town was in Library Street outside of Timberlake’s Garage. To get to the Market Place you walked up Library Street to a junction which consisted of several roads coming together at odd angles. There were no traffic lights or ‘robots’ as we called them. Instead there was a policeman on points duty. Watching him would fascinate me. He seemed to have so much power. He just raised a hand and could hold up a whole row of cars. His different signals were so clear that instead of potential chaos there was order. My favourite time to see him was on a dark winter night. In those conditions he was lit by a strong spotlight suspended across the road. The picture above shows the exact scene from 1961 as I would have seen it. Years later I was teaching in church about how God promised through Jesus to clothe those of us who are believers with authority from the Holy Spirit. As I was preparing I remembered the scene of the policeman on points duty. What made him able to do what he did? Two things. One he had training. He was imparted with an ability to direct the traffic, he had to learn the signals so well that he knew exactly what to do to bring order. Secondly, he had authority represented by his uniform. Without the uniform, even with all the correct gestures, it is possible he would be ignored. There are two similar concepts in scripture concerning authority and power. The word exousia means ‘a right to do something’. We have a legal right to do it. Jesus was someone who taught with a confidence from knowing He had this kind of authority. It’s the word used by Jesus in Luke 9 when He sent His disciples out to heal. ‘He gave them authority’. The Holy Spirit in our lives is the living authority of God. We can operate by His leading in preaching the gospel and healing the sick. The second concept is power. The word is dunamis and is the same word we get dynamite from. In Acts 1:8 Jesus said we would receive power (dunamis) after the Holy Spirit has come on us. Dunamis is the ability to do something. Again its not natural ability but supernatural. We have a right to pray for the sick to be healed and have a commission from God to do that. As we lay hands on the sick we can impart healing because dunamis power is in us. We have a right to speak in tongues (exousia) and when we do its by the Spirits power (dunamis). I learned a lot from that childhood memory. I am learning more and more to live by the Spirit and trust Him. To walk in His authority and express in faith His gifts as He gives the ability. Jesus has given is authority and power from His Spirit. Let’s walk in Him, the Spirit more and more.